Horses, hills, dunes, a stream, the woods, lagoons and extensive wild beaches. Characteristic Uruguayan flora and fauna. Rocha and its rich natural environment. BOOK NOW OUR TRAIL RIDES! The deserted beaches in Rocha are waiting for you, Cabalgatas Valiceras (trail riding in Valizas) proposes you to enjoy an outdoor experience trail riding through the protected area of Cabo Polonio and Valizas’ sand dunes (National System of Protected Areas), declared a biosphere reserve by UNESCO, and also through the coastal lagoons of Rocha: Laguna de Castillos, Laguna Negra; Protected area of Cerro Verde and islands of La Coronilla, Santa Teresa and San Miguel National Parks and the unmissable palm groves in Castillos. 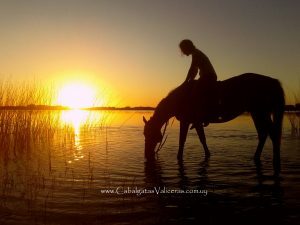 Excellent saddles, dedicated bilingual guides experts in the beauties and dangers of the area will be at your disposal to guarantee an adventure without any unnecessary risks; and, of course, the best horses, carefully selected for each type of rider, there are horses for every level. Beautiful landscapes, historic trails, quicksands, beaches and islands visited by the well-known pirate Etienne Moreau, the Spaniards and the Portuguese. Marine life watching (right whales, killer whales, dolphins, seals and sea lions and sea birds), also native flora, and above all: tons and tons of fresh air! And don’t miss the Full Moon horse trail ride each month! Half-day horse trails and whole-day trail rides, and also longer rides of 3, 5 and 7 days, all inclusive (lodging, food, transfers, trail rides, National Parks tickets, among many other things). YEAR-ROUND trail rides!!! 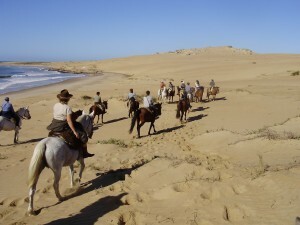 Endless Beach Horseback riding in Rocha Coast Trail and Horse Riding Uruguay Rocha to the fullest. Make up your own group or contact us to join the next trail ride in Valizas with Cabalgatas Valiceras. Information: Tomás Cámbre Street, in the esplanade by the fishermen in the stream, Barra de Valizas, Rocha, Uruguay.